This is our Used Auto-Sleeper Cotswold FB ES 4 Berth 2012/62 Plate. 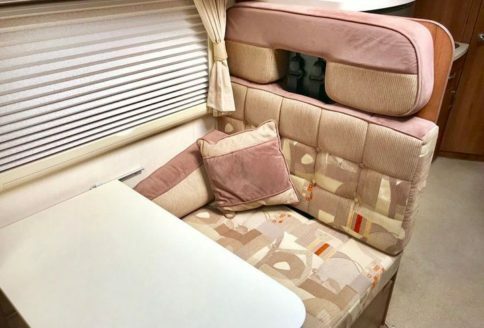 The Cotswold FB, ES is a fixed bed, coach-built motorhome designed to travel and sleep 4 people in luxury and comfort. The Cotswold range is manufactured by Auto-Sleepers, the UK’s leading and oldest motor home manufacturer. 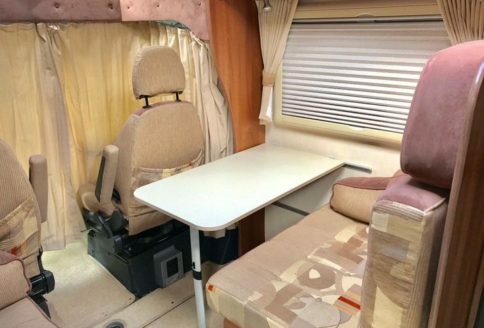 It features a front dinette with double travelling seat, a fixed “French” style rear bed. The Cotswold range is low profile and very stable on the road. 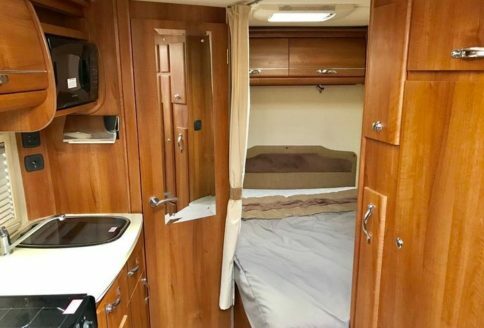 Whilst the Auto-Sleeper Cotswold FB ES 4 berth is ideal for longer holidays, it is just as much at home on shorter breaks too. Our Cotswold FB, ES was registered in September 2012 and was first registered to the supplying dealer prior to the only other private owner. Our Cotswold has covered 22,500 miles. The Cotswold FB, ES has a very good, impressive specification. It has a powerful 2.2, 130 psi turbo diesel engine and 6-speed manual gearbox. Cab features include air conditioning, cruise control and a radio-cd player. More standard features include electric windows and alloy wheels too. The living space has a whole host of good features too. These include a satellite system, refillable gas tank, solar panel, microwave oven and large awning. Cotswold cab specification includes features such as, electric windows and mirrors, a colour reversing camera and an adjustable steering column. As was the norm with all other models in the range, the Cotswold FB ES also has removable cab and habitation carpets as well as swivelling cab seats, arm rests, height and lumbar adjustment. 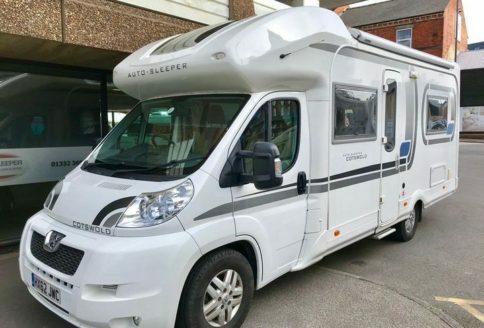 Finally, our Auto-Sleepers Cotswold FB ES has a passenger air-bag, electric step, large awning, satellite television system, refillable LPG gas and rear wind-down steadies. 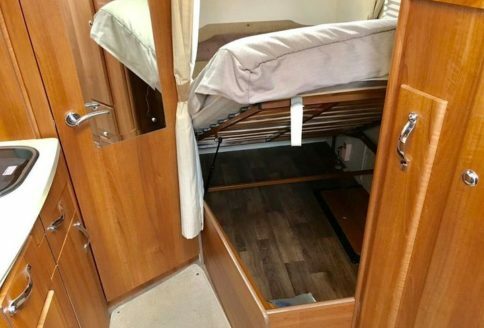 Our Used Auto-Sleeper Cotswold FB ES 4 Berth 2012/62 Plate has a comprehensively fitted kitchen. Thus, it features everything a modern kitchen should have. Features like the full-size cooker with 3 gas burners and 1 electric hot-plate. 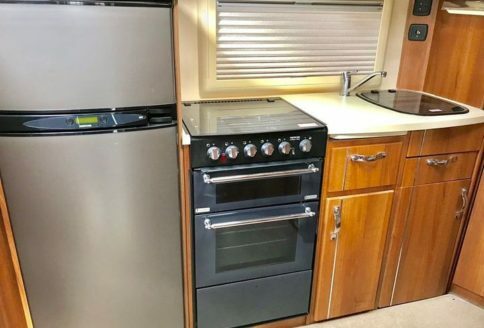 A large oven and grill, a large 3-way fridge with separate freezer and a microwave oven too. So, to accommodate your cooking utensils and equipment it also has lots of useful high-level lockers and low-level cupboards too; there’s even a paper towel holder too. All Cotswold’s feature Webasto blown air heating which blows warm air around the living space and shower room via vents and ducts. The lounge features a dinette with travel seating for 2 in 3-point seat belts and a sofa opposite. Both cab seats swivel for additional comfort. Thus, the lounge will convert into a good-sized double bed when required while the main “French-double bed” is at the rear. Finally, the Cotswold FB ES features a large Sky-View window over the low-profile cab, a large roof-lite in the lounge and large side windows too. The Cotswold FB ES features a practical dinette with table and double travel seat with 2 three-point seat belts. The fixed French bed is always popular. It has a comfortable memory foam mattress and provides lots of storage below. Additional storage can be found below the front sofa and in lots of lockers above and below, all around the motorhome. Rear bed storage space can be accessed by lifting the bed frame or from outside via a drop-down locker door. The bedroom features ample over-head locker storage with reading lights below; these and a large window, provide lots of natural and electric light. There is a large, opening “Heki” style roof light in the roof of the living space and large windows providing lots of natural light and fresh air. Other features include a TV plug-in point while every habitation window and roof vent also features a blind and fly-screen. Finally, outside our Cotswold FB ES you’ll find a large awning and awning light; a gas bbq point, electric step and re-fillable gas point – there’s even a cycle rack. So, outdoors living is well provided for and is very comfortable too.